Happy Tuesday, friends! I'm experiencing some major vacation withdrawals...y'all know how hard it is to jump back into the workweek after a week at the beach! It's #theworst and I'm SO grateful to have the day off tomorrow! 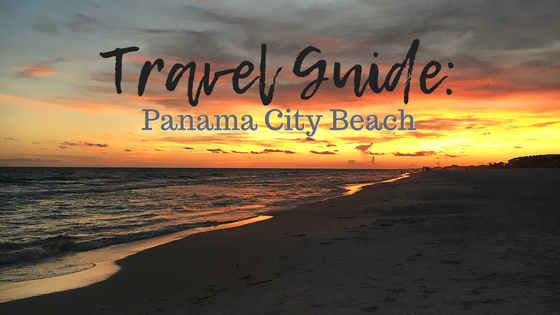 I've put together the ultimate guide to Panama City Beach (one that doesn't include any night clubs or spring breakers, lol) and I can't wait to share with you guys. My Aunt Julie recently bought a condo at the Celadon Resort and we were so excited to stay there for the week! It's a cute little space on the 23rd floor, with a beach front view and room to sleep 6! This trip, there were only 4 of us, and we fit quite comfortably. The suite has everything you need for the week, including beach toys, washer + dryer, coffee maker, and even organic shampoo + conditioner! -Margaritaville: We came here for lunch on Monday and got the BEST fish tacos. Definitely a great atmosphere, and it's at Pier Park, so you can walk around and visit all the shops after you eat! -Sharky's: You can sit inside or outside on their huge deck, listen to live music, and order from a great selection of seafood! Mom and I split the seafood platter and got fried fish, scallops, shrimp, and clam strips. Aunt Julie loved their burger! -Shuckums: This place is for all you oyster lovers. They have tons of different ways you can order them here, and people all around us were getting them by the dozen. They also have karaoke outside which looked like so much fun! -The Back Porch: This may have been my favorite place we went to all week! It's also at Pier Park, and has the nicest outdoor seating area. I got a burger, but Mom got a grilled mahi sandwich and LOVED it. I would highly recommend The Back Porch! -Thomas' Donuts: There aren't really any words to describe how wonderful this little place was. It's literally a shack on the side of the road, but before you even walk up to the window, you can already smell the donuts! They had tons of flavors to choose from, and they also sell breakfast sandwiches and biscuits! Definitely a must when you're in PCB. -Harpoon Harry's: We got to sit right out on the beach here, and absolutely loved their Garlic Pull-Apart Bread! We also ordered their nachos (which was absolutely huge and could feed 4 people, I'm sure) but had to run back to the car halfway through our meal because a HUGE storm rolled in! Honestly, I'm just glad I got to eat the garlic bread. It was that good. -Andy's Flour Power: This was the final restaurant we brunched at on Sunday morning before flying back to Nashville. Mom and I shared the french toast and the "I Want It All" Omelet. Holy moly was this place good! They had a live saxophone player, the nicest staff, and a bakery on the side with allll kinds of goodies. It was the best ending to our week! -Parasailing + Jet Ski Rentals: If you decide to stay at Celadon, you can book these right on the beach! Just walk downstairs and head to the tiki booth to reserve your spot. They're a few yards down from Celadon beach access, so you don't even have to leave the resort. Super convenient! -Shopping at Pier Park: A few minutes down the road from the condo is Pier Park. There are TONS of shops over here to walk through, including an IMAX theater, lots of beach stores, and fun activities like mirror maze and laser tag! This place is perfect for that one random rainy day that always comes. And there you have it! That almost sums up every single part of our vacation. I can't wait to go back and experience new things, try new restaurants, and maybe work up the nerve to go parasailing! LOL. If you've ever been to PCB, what are your favorite things? I'd love to make a list of places I should go to next. Leave a comment below and tell me your fave spots!